Need a fast and easy solution for Valentine’s day? Something quick for you and something that your boy will want to hand out on Valentine’s day? 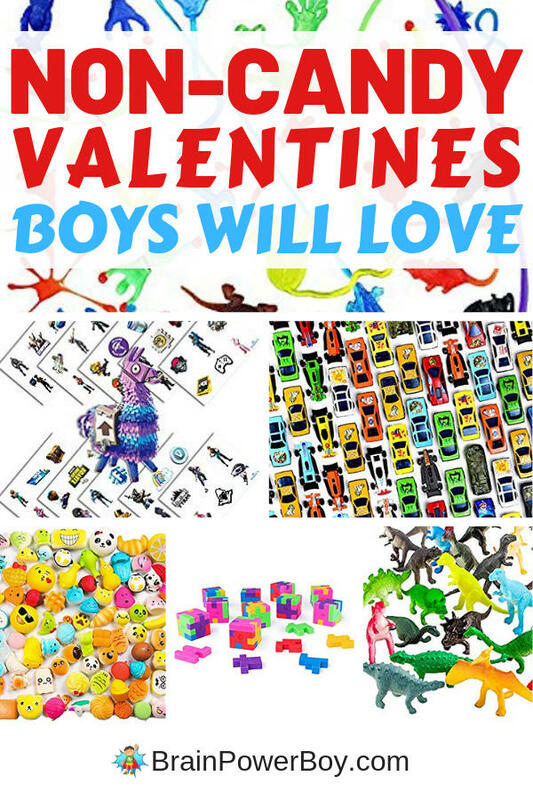 Grab these non candy valentines for boys. Order, stick a tag on them, slip them in a bag, and be done. 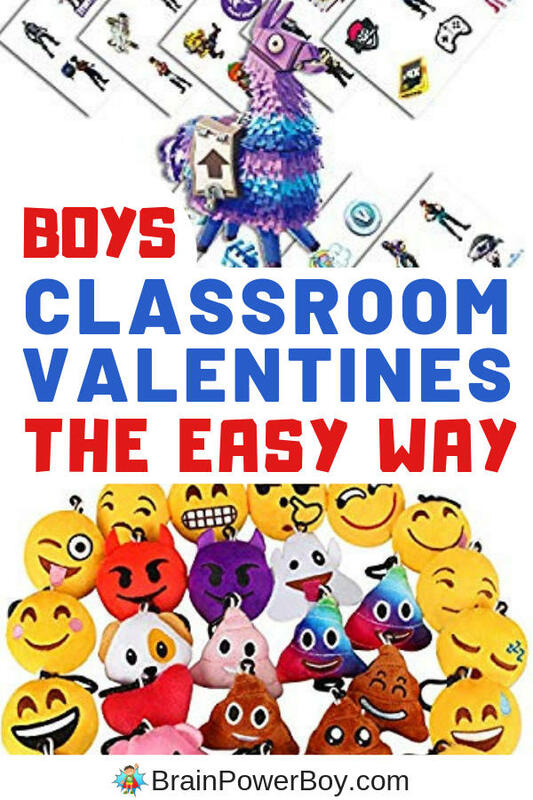 This idea is for busy moms who do not have a whole lot of time to make handmade valentines yet want their boys to have something cool to hand out at their classroom valentine exchange or party. I went over to Amazon and found the best valentine favors, bags and tags. All you have to do is have him pick which one he wants and place the order. He can write his name on the tags attach them with included string or use tape. Super duper simple and quick. Since you are in a hurry, I’m not even going to write much here – let’s go!! I let you know how many items are included in each set. If there are not enough you can order a couple of them, or find a set with a bigger quantity. Oh, and I added some packaging options at the bottom of the post as well. Remember quick and easy is what we are going for here! First up are dinosaurs. 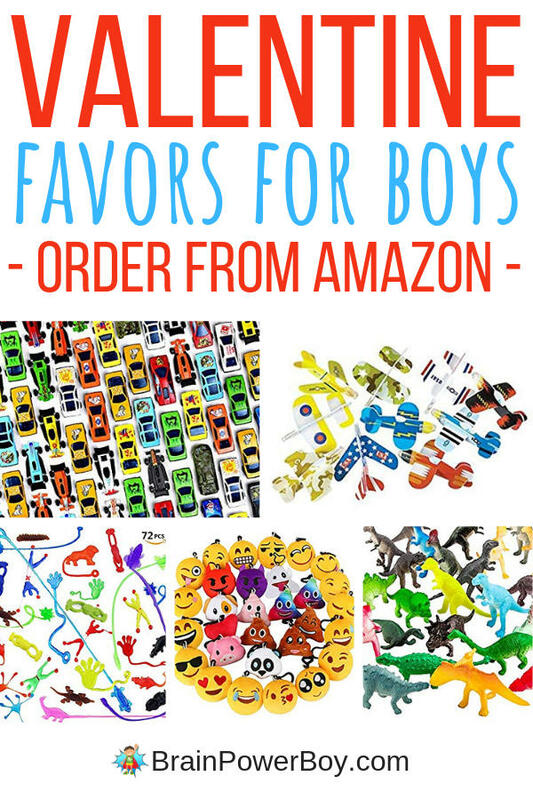 Dinos are super popular with boys and these minis are great. Slip them into a baggie and maybe pop a puffy dinosaur sticker on the outside as well. Cool! These are flying paper airplanes cards. If 32 isn’t enough order multiple sets or try the ones below. These puzzle erasers are fun! They come apart and they can try to re-assemble them into the cube. The puzzle itself is likely going to prove too hard for young boys (preschool, kindergarten, 1st grade) but boys older than that are likely to be able to do it. Some may need help. And, FYI what they mean by sticky isn’t that they are a bad sticky, but more of a tacky sticky, and for some reason guys really like that. Some boys do think these are fun. If your boy does, I found the very best set because there are a lot of designs in here that are very boy friendly. I grabbed the Fortnight tattoos for two reasons. The first is that the game is still crazy popular and boys are playing it whenever they can. The second is because of how the tattoos are spaced on the sheets. Grab the Fortnight tattoos or any of these other tattoos boys will like. These mini bubble wands with a heart on top, make nice classroom valentines because there are 40 in the pack. I won’t bore you with how long it takes to find boy stuff, you probably already know. What a great idea! These plush emoji key chains are perfect. How about an extra strong sensory fidget toy to give to classmates? I think this is a super idea! If you get these sets you will certainly have enough. You could even give a few of them if you like, or save some for other occasions. These are the best deal I could find on a decent car. They are not Hot Wheel quality (if you want those they will run you about a buck a piece here) but they are not plastic and have good reviews overall. There are about 10 styles and they come out to less then 19 cents a piece (at the time I wrote this.) Can’t get much better than that for a metal car. Here is what I suggest you use for tags and bags. If you have ziplock bags at home you may be able to use those instead but these will make things look a bit more polished. There are also valentine options available if he would like those better. Just check the bag size against what you order below to make sure it will fit. I hope you found some non candy valentines for your boys to give for Valentine’s day. Whether he needs to get a bunch for classmates in school, or only needs a few for homeschool co-op, I know he will find something here he likes. And, you can get this done with a few clicks. Super fast and easy.